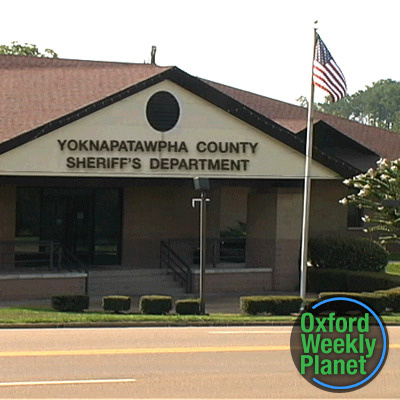 After reviewing and verifying the Kudzu Kids evidence, Detective Armstrong asked Carl Asher to come into the Yoknapatawpha County Sheriff's Department for an interview. Detective Armstrong: Thank you for coming in, Mr. Asher. Please state your name and address for the record. Carl Asher: Carl Asher. 202 Warren. So you said on the phone that I might be coming into money. Something to do with Jennings? Detective Armstrong: That is what I said, yes. Detective Armstrong: I have a few questions I'd like you to answer first. Detective Armstrong: Would it surprise you to hear that I have a footprint at a crime scene that matches those shoes you're wearing. Carl Asher: I'd say lots of people wear them. Detective Armstrong: In your size? Carl Asher: Still lots, just not as many. What does this have to do with newly-discovered assets? Detective Armstrong: We also have video. Carl Asher: Of the footprint? That must be exciting. Detective Armstrong: Of you handling dogs that have been reported missing. Carl Asher: I don't … oh, that must have been when I was helping the animal control officer. That's Officer Riley Scott with two Ts. She'll vouch for me. We all set? Detective Armstrong: Then there's the evidence that you drove the animal control vehicle. Carl Asher: I told you, I was helping her. Detective Armstrong: Since you aren't a county employee, I could charge you with grand theft auto. Carl Asher: Now wait just a minute. Detective Armstrong: Then there’s Joey Sims. Look, Carl, you're in a heap of trouble, and there's only one way to dig yourself out. That's to tell me the truth. Carl Asher: Flunky, at best. Don't believe a thing that guy tells you. Detective Armstrong: And if I told you he called you the brains of the outfit, would he have been wrong about that? Carl Asher: He never understood what I was trying to accomplish, helping Officer Scott. We have a serious problem with strays here in Oxford, and Officer Riley sort of deputized me to help deal with the situation. Carl Asher: With the strays. I served as another pair of eyes. Detective Armstrong: And hands, if you picked up the dogs. Carl Asher: Well, sure. If I just reported the location of the strays, they'd be gone by the time she got there. Detective Armstrong: That makes sense. And what did you do with these stray dogs you collected? Detective Armstrong: I don't. That's why I asked. Carl Asher: Strays are kept at the shelter. Detective Armstrong: So you bring the strays to the shelter after you discover them. Carl Asher: Where else would I bring them? Detective Armstrong: You could return them to their owners. Carl Asher: The shelter has people who take care of that. I didn't want to step on any toes. Detective Armstrong: That's very considerate of you. What I don't understand is why, when I called the county, they had no records of an alternate shelter on the Jennings property. Carl Asher: Like I said, I have no idea what the people at the shelter did with the dogs after I made my deliveries. Detective Armstrong: So how do you explain the video I have of you bringing dogs into the residence of the late Victor Jennings? Detective Armstrong: This might be a good time for you to start telling me the truth. Carl Asher: I mean, sure, but what are we talking about exactly? Detective Armstrong: You might want to start with the dogs you… collected. Carl Asher: I was trying to cut down on the number of stray dogs roaming the city. It's a matter of public health. And maybe sometimes, when the shelter was full, I'd stash the dogs at the Jennings place since I knew it was empty. I mean, I can't exactly bring them home with me. I'm not set up for that. Detective Armstrong: So you set up the Jennings place to hold dogs. Carl Asher: I guess so, yeah. Detective Armstrong: Of the dogs you collected, what percent would you say you found running around, and how many would you say were in a pre-stray condition? Carl Asher: I don't know what that means. Detective Armstrong: How many did you release from confinement? Carl Asher: Some people shouldn't be allowed to own dogs. You drive around, and you see abuse, neglect. It's shocking really. Detective Armstrong: Now you sound like your friend Naomi. Detective Armstrong: You know, from the animal shelter? She's a big fan of yours, isn't she? Carl Asher: Don't drag her into this. She's just a kid. Detective Armstrong: OK. Fine. So you just take people's dogs if you think they're not being properly cared for. Detective Armstrong: And then you bring them to the Jennings property. Carl Asher: If there's not room at the shelter. Exactly. Detective Armstrong: And then what? Carl Asher: I feed them. Carl Asher: I'm not sure I understand the question. Detective Armstrong: You take people's dogs and do what with them? They're not all still in the Jennings house, are they? Because the owners don't have them back, and there's no records of them at the shelter. I checked. Carl Asher: Maybe someone messed up the paperwork. Detective Armstrong: You're not, by any chance, taking those dogs and holding them until the owners offer a nice reward so you can return them and cash in? Detective Armstrong: And if that owner happens to be a nice, older lady who gets a little confused sometimes, you wouldn't take her dog, return it for a reward, and then take it again so you can get more money out of her? Detective Armstrong: Because that would be a pretty sleazy thing to do. But then you learned all about doing sleazy business during all those years working for Victor Jennings, didn't you? Detective Armstrong: Of course, his sleazy business was a lot more profitable than this pathetic, small-time racket you got going now. Carl Asher: I am providing a service. Detective Armstrong: Uh-huh. And what would that be? Detective Armstrong: Without a license or the necessary permits. After stealing the dogs from their lawful owners. Carl Asher: Most of those people don't even deserve those dogs. Detective Armstrong: Carl Asher, you're under arrest for larceny. Did you know Mississippi has a law that deals specifically with stealing dogs? Up to two years in prison plus a $500 fine — each count.